Adam Smithee (Apple of Discord) joins Fes, Tanya, and Mark to discuss five of the ten things you shouldn’t do when making a webcomic. And don’t forget Part 2! The Rampage Network‘s Feature comic this week is O31. Milestones: Insanity of Xade (2 yrs) and Oy (400 strips). News: Estrus Enterainment is looking for colorists and other artists to draw Adult comics (web and print). If you are not comfortable with X-rated or pornographic subject matter please don’t apply. Go HERE for more information and the application requirements. 8-bit theater, Penny Arcade, XKCD, Girl Genius, Font Explorer, Font Creator, Free handwritten font creator. 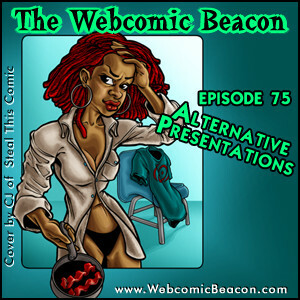 Rebecca Migdal (Rosetta Stone and YouTube) joins Fes, Tanya, and Mark to discuss alternative ways to present your webcomics. Milestones: Sailor Ranco (1 yrs), One Small Step (3 yrs & 400 strips), Sara Zero (400 strips), Alone in A crowd (100 strips), Tao of Geek (2000 strips), Station V3 (6 years), The System Comic (200 strips), Abandon: First Vampire (1 yr), Dan and Mab’s Furry Adventures (1000 strips), Crossing Death (200 strips), Ardra (200 strips), Autumn lake (800 strips), School Spirit (700 strips), This Noise (100 strips), Monuments to Mediocrity (200 strips). 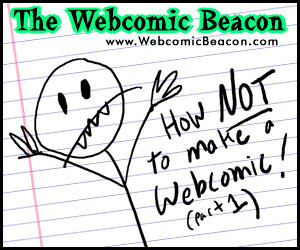 Rampage Network, Webcomics Weekly, YouTube, Gonzo Comix, Mark Crilly, Miki Falls, Slaughter your World, Scott McCloud, Minos the Minotaur, Dinosaur Comics, Red Meat, Apple of Discord, Cybertropolis, Supermegiatopia, Kid Radd, MS Paint Adventures, Night Zero, Tiny Kitten Teeth, Wagon Webcomic Battle, Agent LF, Zordic, ETI-PI, Gypsy! 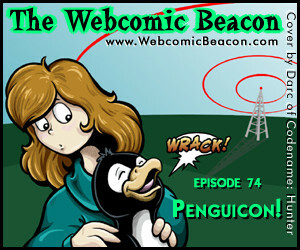 Webcomic Beacon #74: Live at Penguicon 2009! Sorry for a note-less episode. This was recorded during a Penguicon Panel we were at. Thanks to Darc of Codename: Hunter for the cover art!